On Election Day California citizens voted yes on Proposition 67, making California the first state in the nation to ban single-use carryout bags. These bags rank fourth among the types of trash found in coastal cleanups. Environmentalists hope that this movement will take hold and spread across the U.S.
To put the issue of plastics in our Oceans consider that Europe recycles about 26 percent of its plastic; in the U.S., the figure is only 9 percent, which is why our partners at the Monterrey Aquarium Seafood Watch Program asked us to share this article with our readers. Plastic is one of the most common materials in our daily lives. We eat and drink from it, buy stuff packaged in it, and even wear clothes made of it. But what happens when it’s no longer useful to us? Since plastic doesn’t break down naturally, things that had a useful life of just a few minutes can pollute our ocean for hundreds of years. Some plastic starts out tiny; others begin large, but slowly become smaller and smaller pieces. Plastic bags, cosmetic microbeads and other types of plastic trash have spread throughout the ocean—from the surface to the deepest submarine canyons. Plastic debris is also washing back onto our shores, leaving a mess for our children to clean up. This makes plastic pollution a major threat to marine wildlife like fish, turtles, seabirds and whales. 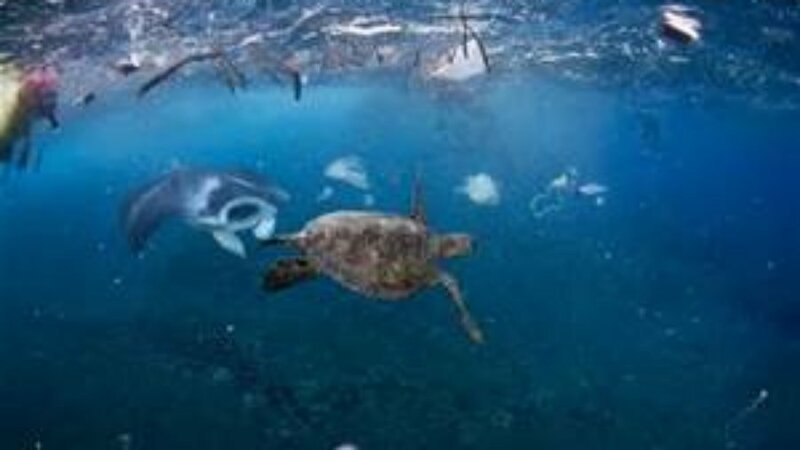 Not only do animals get tangled in plastic trash like six-pack rings, plastic bags and abandoned fishing nets; they also mistakenly fill their stomachs with plastic instead of food. Plastic is made with toxic chemicals such as bisphenol-A, styrene and phthalates. Worse, plastic trash in the ocean acts like a sponge, soaking up pollutants and pesticides from the surrounding seawater. When marine animals eat plastic, they ingest these poisonous cocktails, too. The toxins can concentrate up the food chain and can even end up in the seafood on our plates. Luckily, we can take action. By changing policies and our own habits, we can slow the flow of plastic pollution. Urge decision-makers to help stem the flow. Ask your elected representatives to reduce the sources of plastic pollution. Speak up for bans on single-use plastics. Buy products with non-plastic packaging. Support restaurants that offer biodegradable take-out containers and utensils. Request your drink without a plastic straw. Tell your friends about ocean-healthy businesses. Pick up the habit of toting your own to-go container, coffee cup, reusable straw and shopping bag. Encourage waste reduction in your community. Start a “blue team” to reduce single-use plastic at work. Spark a conversation about zero-waste living on social media. Organize a beach or park clean-up. Think creatively—the possibilities are endless! Reprinted from Monterrey Bay Aquarium Seafood Watch Program.